Save Money Maintaining Your A/C - HeaterEliminate The Muda! « Genchi Genbutsu – Don’t Make Assumptions! You’ve got to count your pennies before you count your dollars. Saving money can be accomplished at so many levels in so many ways. How many times have you seen a post or recommendation on the need to maintain your Heating – Ventilating – Air Conditioning (HVAC) unit? By now you have heard that with proper maintenance you not only extend the life of you HVAC unit but also reduce its energy consumption as well. As an asthmatic I cannot forget to mention the health benefits as well by ensuring clean air throughout the year. Part and parcel of a lifestyle following Lean principles is the concept of challenging the status quo. For years my wife and I have slowly and steadily looked to reduce spending and increase revenue and savings where we can. One of the greatest benefits of launching this blog is that it has provided us with a fresh perspective on our spending habits and has us questioning things we have not previously. Each time our programmable thermostats (installed the day we moved in) signified time to change the filters, I took the obligatory trip down to Lowes to purchase two new ones. Job done. Yesterday the signal lit again. Back to Lowes to purchase two 3M filtrete filters for the low low cost of $30+ ea.! Why had I not questioned this cost before and was there a better option? As usual, 5 minutes on the web and I found a source to purchase 6 filters that have strong recommendations from other customers for only $16.17 each! 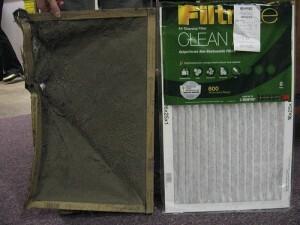 Unfortunately our unit takes the big filters but with a nearly 50% reduction it’s a deal that is hard to beat! In addition I will not have to make a special trip to Lowes ever again saving me time and gas in the process. Below are the filters we needed but if you use a different size click on this link and compare prices for these good quality filters: Find your air filter size here!